Reading Book IV with it’s numerous battles and sieges, particularly the plight of the Spartans trapped upon Sphacteria, made me reflect on how the Peloponnesian War must have looked from the perspective of “the grunt”, the Greek hoplite. First, the average ancient Greek was not a particularly large fellow; from archaeological remains it seems that most Greek men were 5′ 5″ or less and a man was reckoned as tall if he were 5’7″ and very tall if 6′. As the Spartiates composed the top 10% of Sparta’s population and only Athenians wealthy enough to afford bronze armor – this seems to mark the start of the middle-class, at about 20 minae in wealth from land, chattel property or earned income – could serve as hoplites, we can assume they were better fed and slightly taller than average. On this relatively small frame (by modern standards) was loaded bronze armor, helm and a kit in total weighing approximately 60 pounds. 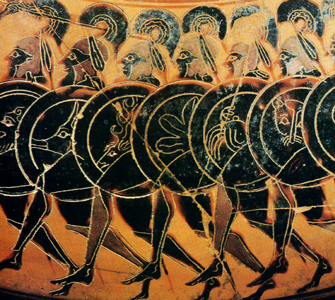 This does not count the weight of the shield (hoplon) or the 7′ spear so in phalanx formation we have an infantry bearing into battle a load likely to be more than 50% than their body weight and for shorter men, upwards of 70%. While the greatest glory was reserved for the hoplite in the front ranks of the phalanx, it was a lot less arduous physical labor to fight as a peltast and much safer to be one of the aristocrats in the cavalry. Consequently, the weight of all this gear and armor necessitated Greek armies marching lightly armored and armed unless battle was imminent, leaving most of the gear and weapons in the baggage train. In The Anabasis, for example, Xenophon shamed mercenaries complaining of the pace by hopping off of his horse and marching fully armored alongside them until his men cried out to demand Xenophon return to his steed. When the Athenians gave the Spartans on Sphacteria no rest from their arrows, darts, stones and javelins, it was no joke. To be forced to keep shields constantly at the ready while trying to repel skirmishers by dashing at them in bronze armor is absolutely exhausting and these tactics broke the will of the Spartans to fight for the first time in Greek memory. It was third rate missile troops that allowed Cleon to make good on his seemingly impossible boasting and (with Demosthenes) win one of Athens’ greatest victories. Hunger and thirst will sap the will of an army to fight faster than the most fearsome enemy. Being on the losing side or suffering injury in battle was an unenviable position in hoplite warfare. If there had not been a negotiated surrender with honorable terms, captives and wounded alike could easily find themselves being put to the sword, perhaps first seeing their wives and children raped and being taken away to be sold into slavery. The fallen on the battlefield (often the leading citizens) would be stripped, creating an urgency for a truce so that the important religious rituals for the dead could commence without further delay or disgrace. If one staggered home wounded and escaped septicemia, there was a fair chance Greek physicians could stitch your wounds and set broken bones, but if you lost your shield (in your haste to flee) you disgraced your family in the eyes of all. If you were a Spartan, depending on how you had conducted yourself, you might be branded a “trembler”, with a patch of cowardice sewn onto your red cloak. War is hard; it’s a lot harder if you were a Greek hoplite. This entry was posted on Monday, November 21st, 2016 at 4:48 am	and is filed under Thucydides Roundtable, Thucydides Roundtable, Book IV. You can follow any responses to this entry through the RSS 2.0 feed. Both comments and pings are currently closed.